In Diana’s Bishop’s life, there is something odd about a lot of things. Hers is a world that appears to be the same as our own, but it which something unusual hides just out of sight of most humans. Creatures, to be precise. Some are vampires, some are witches, and some are daemons, unstable beings who sit on the divide between great genius and madness. The creatures generally manage to continue their lives unnoticed by the human majority, and unbothered by each other, avoiding meeting in large groups in public places to keep their existence from disturbing the peace they keep with humanity. Diana, for her part, is a witch (the descendant of two distinguished lines of New England witches), and is well aware of the creatures that inhabit the world around her. Yet, despite her heritage, she is determined to ignore magic and build an independent life and academic career without stealing an advantage on her colleagues through using witchcraft. As a visiting fellow at Oxford and respected authority on alchemy and the history of science, things are going well for her in this respect. That is, until she manages to call up a book from the special collections store at the Bodleian Library that contains more than she bargains for. Realising that the book is bound in ancient and complex magic, and wanting nothing to do with it, she sends it back to the store and tries to forget about what she saw. However, over the coming days the quiet summer library gradually fills with disproportionately large numbers of creatures, all apparently watching her and waiting for her to do something. Most evident is the beautiful Professor Matthew Clairmont, a secretive scientist who stands out as much for being a vampire as for his startlingly attractive appearance and the academic respect he commands. Witches and vampires don’t traditionally mix, so why are Diana and Matthew so drawn together? What did Diana find that day in the library, and why does the discovery pique the interest of so many creatures that previously ignored her? So starts a novel that is part history, part fantasy, part love story and almost entirely absorbing. While the opening paragraph of “A Discovery of Witches” sucked me into the story very well – any book lover who has set foot in the Bodleian couldn’t help but marvel at the wonders it might well contain – I found much of the opening section a little stilted and over-written, as if the author was trying too hard to sound like a proper novelist. I sighed a little and thought at this point that I might be in for a very long read. Fortunately, once Harkness gets past the chore of trying to describe Diana and her immediate surroundings in a suitably literary way and instead concentrates on the character background and real meat of the story, the stiffness in her writing evaporates and it all starts to flow much better. Get past the first chapter, and the love of the writer for books, history and the beautifully imagined fantasy world she has created comes across to create a book that it is very hard to leave alone. I was carried along very nicely indeed until a few chapters around the middle of the book, when the narrative moved away from what I felt was the story proper and lingered far too long for my liking on the inevitable romance between witch and vampire – it may have been far more intelligently done and elegantly written than “Twilight”, but that doesn’t mean I had any more patience for it. But of course, I suspect a lot of readers of a more romantic bent will disagree with me on this point. 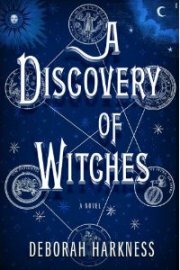 “A Discovery of Witches” is a novel that combines the best of historical fiction, science fiction, fantasy and mythology – and a good deal of romance. It is for the most past well paced and engagingly written, and Harkness has managed to create an intriguing underworld that fits in well with our own known world and history, making it come to life in an entirely believable and rather clever way. The characters are well-developed and lifelike, and great thought and detail has gone into every aspect of the background, and even to the title. The title is of course a nice play on the infamous work “The Discovery of Witches” by notorious English witchfinder Matthew Hopkins, which described what he saw as symptoms of witchery and techniques for finding witches in the general population. The past persecution of women believed to be witches does arise in the novel, although the only witch-finding that is done is distinctly not by humans – the people who want Diana are all other creatures. It is perhaps unsurprising that the author, Deborah Harkness, is a professor of history; the author of several non-fiction works previously, this is her first novel. That the author is an academic comes across in her writing, in the best possible way – like Philippa Gregory (who holds a PhD), the writing is articulate, erudite and meticulously well-researched, weaving historical and mythological information seamlessly into the narrative. The author has said she became a professor because she loves to teach what she is enthusiastic about, and this has doubtless allowed her to develop her ability to communicate with great passion. The book is aimed at intelligent readers, but manages to stay away from dry, academic prose, instead remaining lucid and enchanting. It is quite hard to believe that this isn’t the work of a far more experienced novelist. I must admit that if I hadn’t been sent this book as a review copy, I would probably never have read it, being put off by the very mention of the word “vampire”. The saturation effect on modern popular culture inspired by the insipid novels of Stephanie Meyer has unfortunately meant the vampire – a potentially fascinating mythological creature to use in literature, as ably demonstrated in Elizabeth Kostova’s “The Historian” – has been relegated to nothing more than an excuse for a brooding romantic lead. While Matthew Clairmont does for a time mid-novel seem to be behaving as if he is in a version of “Twilight” for grown-ups, there is fortunately sufficient depth and interest in the characters to raise “A Discovery of Witches” well above this. Other than the slow mid-section, I demolished the book in remarkably short time, considering it was 590 pages of dense text; always a good sign that I have enjoyed a book. Barring one or two small points, I really enjoyed reading this book and will look out for future works by Harkness. The only problem I have is that this was pre-release review copy, not available in the shops until February 2011 – so it will be a long time before I get to find out what happens next! With thanks to Headline Books, who provided me with a review copy of this book. 2 Comments on "Oh, Oh, Oh, It’s Magic!"